The evolution of the wrinkle filler has led to an amazingly effective product called Sculptra Aesthetic. But Sculptra is not a wrinkle filler – it’s a volumizer. It replaces the natural volume (fat) loss that occurs as we age. It’s the volume loss that is responsible for the appearance of age. A young face has fullness and roundness in the cheeks, under the eyes, in the lips and around the mouth. This fullness causes light to reflect with very little shadow. The human eye is drawn to reflected light. Sculptra is the first facial injectable that gives you subtle results over time. It replaces lost collagen giving you a more natural-looking appearance without giving you away. A full treatment of Sculptra, an average of three injection sessions over a few months, can last more than two years. You’ll have more time to see how sensational subtle can be. How does Sculptra keep delivering results over time? Our bodies are constantly producing new everything: new cells, new collagen, new tissues. As we age, our collagen production tends to decrease. Sculptra injections stimulate our skin to “rev up” the production of collagen. It works with your skin’s existing collagen and initially replaces it, then reinforces it, strengthens it, and stimulates the production of new collagen. Sculptra is made from a synthetic material called poly-L-lactic acid, which is gradually and naturally absorbed by the body as it works to replace lost collagen. Poly-L-lactic acid has been used safely for decades. It’s been used in dissolvable stitches and as a facial injectable since 1999 in over 30 countries. The reason that it lasts so long is that this primary ingredient, PLLA, lasts that long before the body gradually and naturally reabsorbs it. Who are the best candidates to use Sculptra? Patients range in ages from late 20’s to early 80’s, but the bulk of patients are typically in their 40s and 50s. As with most things, the earlier you start, the better and easier to maintain natural results at minimum cost. Typically, around 35 years of age is when someone might consider some volumizing with Sculptra. And it isn’t just for female patients either. An increasing number of men are jumping on the Sculptra bandwagon as well. Indication and Important Safety Information: Sculptra Aethestic is intended for use in people with healthy immune systems as a one time treatment regimen of up to 4 injection sessions that are scheduled about 3 weeks apart for correction of shallow to deep nasolabial fold contour deficiencies and other facial wrinkles. You should not use Sculptra Aesthetic if you are allergic to any ingredient of the product or have a history of keloid formation or hypertrophic scarring. It should not be injected while you have an active skin infection or inflammation in the treatment area and should not be injected into the red area of the lip. Side effects may include injection site discomfort, redness, bruising, bleeding, itching and swelling. Other side effects may include small lumps under the skin that are sometimes noticeable when pressing on the treated area. Large lumps, some with delayed onset with or without inflammation or skin discoloration, have also been reported. Clinical trail ended at 25 months. Individuals results and treatment regimens may vary. What results can be expected from Sculptra? See this remarkable transformation with Sculptra over time. It works gradually to replace lost collagen – a key cause of wrinkles, lines and folds. 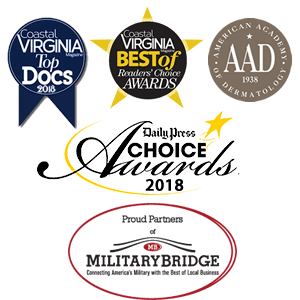 To learn more and schedule a consultation, contact Associates in Dermatology at 757-838-8030.